In our earlier conversation, Derrell Bradford said that the generally accepted idea that about half of teachers leave after their first five years is a "manufactured" fact. Another moment of exposure had to do with teacher attrition. After a discussion about the “last in, first out” policy, Louis asked Black if she was concerned that almost half of New York City school teachers leave after 6 years in the classroom (PDF link). Well you have to know, like, what’s really at the heart of the issue. I don’t know that we know what’s really at the heart of the issue. Teaching is a hard job. We want the ones who are committed. We want the ones who make a difference. We want the ones who want to work hard and really change the lives of these young people. They’re there on a mission. So, you know, some are going to leave. She then returned to the “last in, first out” question, arguing that perhaps teachers would be less likely to leave if they weren’t concerned about being laid off. “Right now there have to be a lot of teachers thinking, ‘Maybe I don’t have a job next year.’ Can we afford to have thousands of teachers think to themselves, ’I have to leave the system now because I may not have a job in a few months?’ That’s going to be a catastrophe,” she said. Gee, I guess you'd better avoid layoffs then, huh? I will say that the report acknowledges that we don't know where these teachers go, and that it is possible many leave for the suburban schools. That's different than what I have sometimes said in the past - that they are leaving the profession. I've not seen a meta-study on this, but most of what I've read says 30-50%. This is not "manufactured," Derrell - it's a real problem. And it's at least as bad, if not worse, in charter schools. The next time Bradford or anyone else tells you how "shocking" it is that so few teachers are dismissed through tenure proceedings, ask them how many specialized, licensed professions like teaching have attrition rates this high for new entrants to the field. Many bad teachers leave on their own, because it's a very hard job to do when you do it badly, and the low pay doesn't justify sticking it out. It is, to a large degree, a self-policing profession. @jerseyjazzman on tchr attrit...I did not say the facts were manufactured. Said the conditions manufacture it. it's totally an issue. You can see the transcript of our Twitter exchange below. That wasn't how I read Derrell's comment, but what he wrote is consistent with his tweet above. So, I apologize for misinterpreting his tweet. As I said, Twitter is a bad forum for this kind of exchange - precisely for this kind of reason. I must say I found it more than a little odd to hear his supporters cheering for Camden laying off half of its police force. The rhetoric isn't changing, but it is getting a little more blunt. At the end, Christie tells the cop (?) who questioned him about increasing health benefit contributions that he should consider himself lucky to even have a job. Time To Feed the Base? I've been waiting for this for some time: Chris Christie is starting to figure out that he can't keep withholding money from the towns that elected him in the first place. So he's floating the idea of changing the school aid formula, apparently in the hope his base gets some dough back to their own communities. And his cronies in the Senate have their own scheme for shifting money away from the Abbotts and back to the wealthier towns - this time by gutting preschool. I've said before that I thought Christie's very personal animus toward the NJEA was best expressed in how poorly he has been treating the towns that got him elected in the first place. He was willing to have hundreds of towns struggle last year with layoffs and budget cuts and higher property taxes just to make a point to the teachers union. Well, maybe he's wised up. Or maybe he had a Machiavellian scheme already worked out: starve the 'burbs for a year, then ride to their rescue with state aid that's smaller than a few years ago but still better than nothing. I started out thinking this was the plan, but then changed my mind when I saw how impetuous the guy is - he doesn't seem like the guy who plans anything. In any case, it's a very dangerous game he's playing: if he doesn't deliver any aid to the 'burbs for yet another year, I think his base is going to be really, really pissed off. And he may not be able to: he doesn't have the court he wants (yet), and the Legislature may put up a fight. Further, the amount of aid the towns get back may not be enough to stop the program cuts wealthy towns never thought they'd ever have to consider: sports, arts, electives, full-day kindergarten, etc. The soccer moms (and dads) will never forgive him for that. I tried to warn you, Corey: he will stab you in the back if he thinks it'll be good politics. 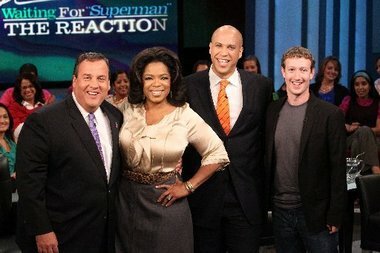 Newark is sure to get screwed if this goes through; will you look good doing more photo-ops with him if that happens? Of course, there is still plenty of blame to be shoveled out over the teachers, and we'll no doubt be hearing lots about "Cadillac health plans" and "unsustainable pensions" in the coming months. But I think (well, maybe "hope" is the better word) that even that argument is starting to wear a little thin. The stupid attacks and town hall videos have backfired more than a bit, except among the faithful. And it's pretty obvious that trashing tenure and adding a few more charters schools isn't going to reduce anyone's property taxes very much, if at all. People want solutions that directly affect their lives and/or their pocketbooks and they want them now. Christie didn't deliver any last year; can he survive another year of inaction? A seniority rule in state law requires that the teachers hired most recently be the first to face layoffs. As a result, city officials estimate that every teacher hired during the past five years would be let go if the state moves forward with a $1 billion cut in aid to city schools. Mr. Bloomberg said this tenure rule means the city will "have to part company with some of the best teachers." And because new teachers are typically employed in communities that are struggling the most, these layoffs would "disproportionately hurt the schools with more minorities," he said. And what would prevent "good" senior teachers who make more from being laid off in this climate? The goodness of Mayor Bloomberg's heart? By the way: they're talking about cutting 20% of the teacher workforce. "Andrew Cuomo was brought in to balance the budget. He didn't create the situation. But he's got to deal with it," he said. "And it's Medicaid and education—two things everybody says don't cut. But those are the things where all the money is." No, Mike - all of the money is in you and your buddies' pockets. And you've gotten away on the cheap way too long - time to pay up, sport. The footnote directs to a broken link at the NJ Charter Schools Association website. 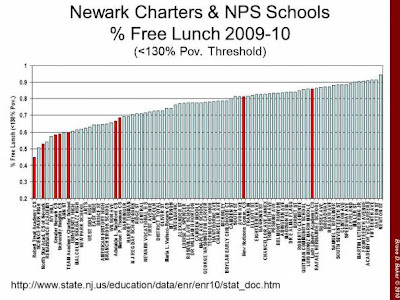 Could it be they pulled it down because the notion that charter schools serve more at risk kids is completely and totally contradicted by the data!?! The basis for these beliefs is crystal clear. The Crawford boys begin there school day with a heavy police presence in and around the school resembling more of a prison environment than a learning community. Once inside the classroom, the Crawford boys see students sleeping in class or being threatened in the halls. They see good students being mocked and made out as betrayers of their culture. Expectations here are low for the Crawford boys. In a state that prides itself on being highly diverse, the school is almost entirely African American with many from the housing projects that feed into the school. The vast majority of these children are eligible for free or reduced price lunch due to family income levels. The Crawford boys see lives routinely destroyed in the neighborhoods surrounding the school because of AIDS, gangs, violence and drugs. The effects of poverty also take their tolls on physical and mental health. Many students come from single parent households like the Crawford boys whose father is now suffering from serious health problems himself. In this neighborhood, role models for education are hard to come by. As a result, many students do not see the need to graduate from high school or to go on to college. Many will end up dead or addicted or unemployed and become part of the numbers that make up the call to action established previously in this report. Shouldn't these problems - which are completely out of the control of Newark's teachers - be taken into account when evaluating their performance? And do you really think a teacher (or a student) in wealthy communities like Chatham or Millburn should be judged by the same standards? Some day, we'll have an adult conversation about this. We'll talk about the price paid for tracking kids in urban schools vs. the benefits. We'll wrestle with the fact that we already have segregation today in our schools - segregation by district. We'll talk about how charters and vouchers are really more about the cohort a child learns with than anything. I've written before about Derrell Bradford, Executive Director of Excellent Education for Everyone (E3), and how he was appointed to Chris Christie's "Education Effectiveness Task Force," despite his complete lack of practical teaching experience, technical knowledge, or academic expertise. You would think that a guy like Derrell and I don't have much in common; turns out we both had nothing better to do last night than engage in a Twitter exchange. I've posted it below, but understand: trying to read a Twitter conversation is like trying to make sense of e. e. cummings translated into Martian. People keep jumping in, you don't know who is responding to what - it's a big mess. A couple of other posters including stopthefreezenj, frankbeard, and DefeatNJBullies jumped in, and the whole thing got a little chaotic. The fact is Twitter is a very bad forum on which to discuss this stuff. I think I'm fair to Derrell in the transcription below, but you can always go to his own Twitter feed and judge for yourself. I kept in everything he posted, and I think I mostly got the timeline correct. There is, of course, no good answer for Derrell to give: he holds no degrees in education or any related field, he has never taught or supervised in a pubic or private school, and has never published any research related to teacher evaluation. His sole work experience before E3 appears to be limited to editing a magazine about nightlife. Yet my colleagues and I, who had to qualify to get our teaching licenses, spend our days actually doing the work that is supposed to be evaluated, and are represented in negotiations by the NJEA, did not get a representative at this table. Can you understand how insulting it is that Derrell Bradford gets to shape policy that directly affects my job while I and every other NJEA member sits on the outside and waits for his edicts? Worse, there is very little indication here that Derrell has even tried to address the very serious and legitimate concerns teachers and researchers have about the flaws in the new crop of teacher evaluation systems pushed by 'formers like Michele Rhee. I've been over the problems with Value-Added Modeling (VAM) over and over again on this blog, yet no one on this panel - especially Derrell - seems to have anything approaching the technical expertise able to address this central issue. In fairness, Twitter is not a good forum for displaying your educational acumen. Maybe Derrell really is up on the statistical modeling used to create VAM ratings, but I have my doubts. I'll also point out that this entire exchange started with stopthefreezeNJ's extremely important question about how to assess teachers whose students do not take standardized tests in their fields - and that, according to Bruce Baker, includes a great many teachers. Any indication Derrell or his cohorts have the ability to address this issue? Nope. @jerseyjazzman it's coming whether you like it or not. You should work to shape it, or it will shape you. Now how exactly are my fellow teachers and I supposed to do that, Derrell, when you've taken OUR seat at the table? Hey @Dyrnwyn, you guys got merit pay for gym teachers and inclusion specialists worked out yet? @stopthefreezeNJ working on assessments for them too. Teachers will be evaluated, fairly. And when I say teachers, I mean all of them. @Dyrnwyn Teachers are already evaluated. Fair evals are thx to unionization and tenure. If you were a teacher you'd know that. @jerseyjazzman legit tchr protections have been perverted to advance NJEA economic interests. Both good and bad tchrs pay same amnt of dues. @Dyrnwyn Patronizing. Teachers perfectly capable of judging value of dues. No union = poor work conds, less pay. You want that? @Dyrnwyn BTW what r your qualifications to serve on panel about teacher evaluations? Have you ever taught in public school? Any ed degrees? @jerseyjazzman five year attrition is manufactured. Young tchrs get tough schools and bad pay. Of course they leave. @Dyrnwyn Glad to hear you are for better teacher pay. Tell Chris Christie when you see him not to slash pay through huge benefit contrib. @jerseyjazzman you're arguing for a new eval system. That's why I am working on one. @Dyrnwyn So it won't include VAM, shown to have huge error rates? @Dyrnwyn Everyone wants that. Support NJEA's tenure reform plan. 90 day limit on tenure cases. @jerseyjazzman union prioritizes all teachers the same regardless of talent. Do you want a system that makes teachers widgets? @Dyrnwyn I want due process and fair evals. VAM is not fair. @jerseyjazzman don't buy the degree/process argument. Every teacher in Nj's worst schools is certified. Clearly it isn't a predictor. @FrankBeard @jerseyjazzman frank. I am with you. No one believes it but we want bad managers out of the picture...now. @FrankBeard @jerseyjazzman No system is perfect. But ours must be better. Objective and subjective factors both considered. @Dyrnwyn So I should just trust you and Christie? No thanks. @FrankBeard @jerseyjazzman it's not going to be just test scores. But they will be a part of it. @jerseyjazzman I think you have to consider more pay ring also driven by eliminating bad teachers. Money Ill spent. @Dyrnwyn Question stands - what are your qualifications to serve on panel? Have you ever taught? @FrankBeard Exact problem of VAM. Peer and supervisor evals best solution. And if you want best & brightest to teach - PAY THEM MORE!!!! @jerseyjazzman I think there's actually a plan to roll it out for teacher input after it's done. Either way, the ship has sailed. @jerseyjazzman you don't have to trust me, or @govchristie. See the plan and make your own decisions. Seems you've decided already though. @jerseyjazzman what we have now is not fair. neither system is perfect...but we can make one more precise than the scattershot we have now. @Dyrnwyn 35% is scattershot to me. @jerseyjazzman you're arguing that because it's not perfect we shouldn't do it. I don't buy that. Cane be better without being utopia. @Dyrnwyn You assume "new" is better. @jerseyjazzman that reform plan...it wasn't even a good first step. more like standing up well...no motion. @Dyrnwyn That is not a serious rebuttal. What is your specific objection? @jerseyjazzman guild mentality is part of the problem. A person isn't a member of the education clique, and somehow they don't matter? @Dyrnwyn Very silly. What is specific objection to NJEA proposal? @DefeatNJBullies @govchristie @jerseyjazzman NJ bullies lives to spin anything I say. Comes from having nothing to contribute. So sad. @DefeatNJBullies ask @govchristie. PS. I am not the only non-teacher on there. Perhaps that is what you fear? @DefeatNJBullies @govchristie @jerseyjazzman knowing you shouldn't teach does kids a favor. Be nice if others were as introspective. @jerseyjazzman btw...I didn't answer your question b/c I knew NJ bullies would answer it for you. @Dyrnwyn You don't think I have legit question? What are your qualifications to serve on panel to develop evals of ME? @Dyrnwyn You will affect MY job - what are your quaifications to do that? @Dyrnwyn how will those assessments account for factors teachers cannot control - poverty, attendance, trouble in the home, disability? @jerseyjazzman I assume what we have is imperfect and needs to be chained. @momactivist I'm all for that, but how do you set it up when ONE teacher serves on gov's panel for teacher eval? @DefeatNJBullies good thing Microsoft has already. Against ai and real people. Makes sense huh? @stopthefreezeNJ it's fun how folks Teot out Tesr Scores when great, bur when they are bad, results are beyond school control. @stopthefreezeNJ to your point...growth and student weight. @momactivist @jerseyjazzman I will give it to the great freely. Never to the terrible. @momactivist @jerseyjazzman lots of talk about pd and @govchristie proposes master teacher for the best teachers. @Dyrnwyn OK - will you pay this person more than they make now? @jerseyjazzman like I said...ask the Governor. @Dyrnwyn That's a terrible answer. I'm asking you - what do you bring to the table? Why should you have a say in my eval? @Dyrnwyn ...we replace all "bad" teachers? @Dyrnwyn Will the master teacher make more? How much more? @jerseyjazzman it's the right answer. I did not pick me or any of the other people on task force. @Dyrnwyn So you can't even justify your own membership on this panel? @jerseyjazzman it could. But I think you'd have a solid argument for why it should then versus now. @jerseyjazzman not sure. This whole thing, of course, would require collective bargaining reform too. @Dyrnwyn Well, now we're getting to it. You say you want better teachers, but you don't want to pay for them. @Dyrnwyn Please answer @jerseyjazzman's question - what SPECIFICALLY qualifies u to determine how educators are evaluated. Cause celebre? @Dyrnwyn Yet you are on panel to tell him to do that. Why you? This is my career. Why you? @Dyrnwyn OK Christie wants to slash teacher pay via pension/bene contributions. Do you support? @jerseyjazzman also...I will not be evaluating you. Your school leader will be. @jerseyjazzman That's Your choice. I can inky tell you I am approaching insincerely and with a reattach respect for great teaching. @Dyrnwyn That speaks to why you were chosen. I'm asking why you are qualified. Big difference. Do you have expertise in this area? @jerseyjazzman I did not say that at all. @jerseyjazzman likely because e3 and the Governor's policy agendas are enormously similar. Same world view in many cases. @jerseyjazzman dude. Pensions are out of control everywhere in the country. Ds and Rs are all talking pension reform. @jerseyjazzman there is one classroom teacher on the panel. I think I was chosen precisely b/c I don't have the exp you want. @stopthefreezeNJ @jerseyjazzman nah...you're not going to get the answer you want. I am not a teacher and don't claim to be. @Dyrnwyn You admit you have no experience. Will you be designing evals for air traffic controllers next? @Dyrnwyn It's funny how 92% of NJ schools are proficient, yet u and your crew are gaming poverty so corporations can profit from education. @stopthefreezeNJ @jerseyjazzman ...are highly qualified? give me a break. Do you realize how destructive what you perpetuate is? ... you are appointed to a panel to do just that - and yet you can't say what qualifications you have to do the overhauling! Can you understand why maybe - just maybe - us teachers - the ones actually DOING the teaching - doubt the sincerity of this effort? @Dyrnwyn Your argument relies on absurd assumptions - the most glaring being the notion that "bad teachers" plague urban cities. @Dyrnwyn You also cite cost without context - NJ is most expensive in most areas. This is your crew's MO - decontextualized info. @stopthefreezeNJ you can pass an NJ assessment with a 50%. you've disguised failure as success for decades. Your proficiency is bogus. @stopthefreezeNJ 80,000 kids are in schools you wouldn't send you dog to, but you have no answer for that but more time and more money. @stopthefreezeNJ you preside over the most expensive schools in america. But these kids pay the price with their lives. It's disgusting. @Dyrnwyn BTW don't know why you say I 'preside' over anything. I certainly don't. @Dyrnwyn and this entire time you have NO ANSWER for how to deal w mitigating factors: POVERTY, ADDICTION, HOME LIFE, DISABILITY. No answer. @stopthefreezeNJ not my assumption...try #edtrust. @DefeatNJBullies amazing ow the most expensive schools in US are underfunded. Stop reading right there. @stopthefreezeNJ here is what the NJOSA does: http://tinyurl.com/482xyyx gonna send $340 mil to districts for kids they don't educate. @stopthefreezeNJ ridiculous...same line of reasoning that says NJ has low state share even though it's paying through the nose. @FrankBeard Weight for influence of other factors and measure growth. Teacher matter no matter the kids or their circumstances. @jerseyjazzman then you know what...you'll do just fine under the eval system. @Dyrnwyn Why should I believe you on that?! You have no standing to reassure me. You may as well eval plumbers while you're at it. @jerseyjazzman whatever man. I've answered your question. You just don't find my quals sufficient. That's on you. @Dyrnwyn Your quals are NOT sufficient. You have not EARNED the right to judge me. @FrankBeard seriously not there yet. Actually still reviewing other plans from across the country before moving to final recommendations. @Dyrnwyn you are asked repeatedly what qualifies you to shape ed policy, your response was literally, "I care." Laughable. U r a tourist. @stopthefreezeNJ tourist. I love it. @stopthefreezeNJ @jerseyjazzman @frankbeard none of you will food just got here but it did. More than willing to pick it up 2mrw. @Dyrnwyn @stopthefreezeNJ @frankbeard Enjoy your dinner. You are right - this is NOT over. @jerseyjazzman Like I said...I won't be...your principal will. And his super is gonna eval him. It is how it is. Sorry. @Dyrnwyn Derrell, trust me - I am working hard to shape it. And I've EARNED the right to shape it. @jerseyjazzman @stopthefreezeNJ @frankbeard fine with me. I have a 5-1 in JC on Monday. No stranger to high odds...like 120,000 on 1. @Dyrnwyn @jerseyjazzman @frankbeard so we are clear, no answer re: qualifications. Goodnight. @Dyrnwyn @jerseyjazzman @frankbeard and also no answer re: how to account for poverty, disability, home life, etc. Weak and embarrassing. Public non-answers on ed "reform" from @GovChristie and @Dyrnwyn piling up. Can't edit twitter, guys. Your Useless Study of the Week! No More Lunch at School!